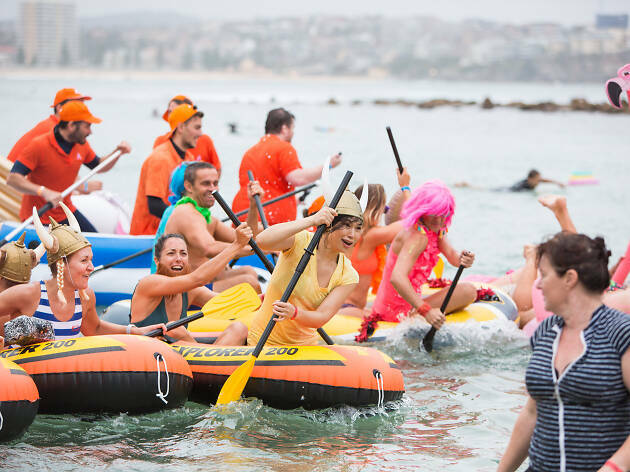 Shelly Beach will be taken over by inflatable swans and blow up thongs on March 17 for this annual floaty ocean race. Competitors will to take to the high seas aboard their blow-up vessels for a one-kilometre sprint from the sand towards the watery horizon, while spectators laugh at the bumbling parade. The mad splash will kick off at 10.30am in the calm waters at Shelly Beach, but racers will need to register and breath life into their boats at South Steyne Promenade. Racers are encouraged to dress up (the fancier the better) for the race, and if last year is anything to go by, there’ll be prizes on offer for the wackiest team, craziest boat and best fancy dress, as well as awards for those first and last over the line. Enjoy a scorched sanga at the awards ceremony will after the event. The race was named the ‘Community Event of the Year’ at the 2016 Manly Australia Day Awards and has raised over $200,000 for charity over the 14 years its been running. This year the money will go to Tour De Cure – Riding to Cure Cancer, who have raised over $32 million for cancer research. Get yourself a seaworthy craft (or a not-so-seaworthy one) and have a paddle for a good cause.